I’ve written before about making my bed and why it is a goal worth pursuing, two and a half years ago, actually, and while I make my bed occasionally (which is a great improvement upon never, by principle), it is hardly a habit. This is the 7th of the month and I’ve had one week, 7 days, solid, in a row, of making my bed. Improvement. But why start with this habit, particularly under the “organization” category? So, one reason I want to establish the habit of making my bed is because it is representative. It is a task that takes about 45-seconds, that does affect the overall feel of the room, and that communicates to myself that I am going to fight and resist my natural tendencies, that I am not going to flow down the path of least resistance anymore. It is not so much the made bed itself that is the goal, but the “easy win” factor. 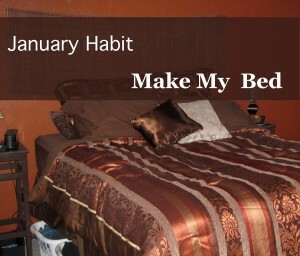 By making my bed in the morning I se the tone for the day. It is a victory of willpower (because I’m pathetic and require willpower to make my bed) that doesn’t tax my willpower much (not, like, breaking a habit of eating chocolate in the evening – for a purely theoretical example). And walking in upon a room with a made bed is a reminder throughout the day that I am in charge, I am making progress, I am becoming a more orderly person. To reinforce that (and to increase the number of stairs I do in a day), I’ve started using our master bathroom during the day instead of the powder room off the kitchen. Maybe that will also motivate me to keep the master bathroom cleaner. That would be nice. 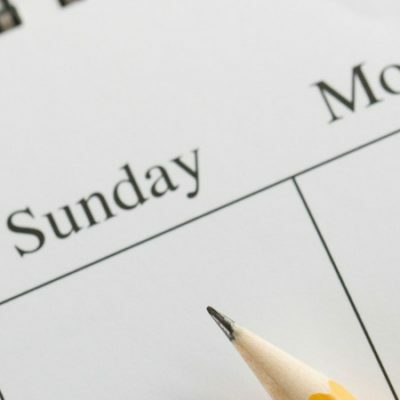 By beginning my habit project with tasks that aren’t taxing (make my bed, read my Bible & pray, drink water), that give immediate positive feedback (mentally, spiritually, and physically), I am limbering up my willpower with easy victories. They are easy choices, yet they are daily decisions of order over sloth, of aligning myself with self-discipline instead of self-indulgence. What kind of a person am I? I am the kind of person who makes her bed. Every morning that I make my bed, I make that claim just a little more true. I agree!! There is “something” about a made bed that make a room filled with clutter look more organized instantly. Based on a popular children’ book series, if Mom makes her bed, then she’ll see that the nightstand needs cleaning and clean it off. Chances are once the night stand is clean, she’ll notice the floor and ask for a vacuum cleaner……..